The Big Pine Tree House is an easy escape from the pressures and constant fast-paced life of the City. Cabin rentals are scattered throughout the Hocking Hills area, but few can match the distinguished charm of this unique beauty with its ideal location and spectacular view. 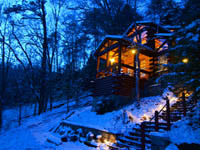 The cabin is a four-level structure that is built into a hillside, giving the feeling of being high up in a tree house. The cabin sits on 24 acres of beautiful rock formations, creeks and woods. The acreage also includes the property across the street from the cabin that literally backs up to one of the most gorgeous, lesser-known caves called, Salt Petre Caves. Cabin can accommodate up to four people. Two bedrooms with queen beds, two full baths, full kitchen, two decks, four person hot tub, Sirius/XM radio. Huge DVD Library. Centrally located to caves, zip-lining, horseback riding and more! Cabin is adult-only, non-smoking and pet-free. The cabin is a four-level structure that is built into a hillside, giving the feeling of being high up in a tree house. Two bedrooms with queen beds, two full baths, full kitchen, deck, hot tub, Sirius/XM radio. The cabin exceeded our expectations. Everything you need and more. We will be back. We just stayed the the first weekend of November 2017. This was our second time staying here (it was so great the first time, we had to it again), and a couple of my friends' first time. Everyone loved it! The cabin is so unique and pretty, you can spend hours admiring it! Julie and her husband are so great to work with, and do their best to make your experience as great as it can be. We will definitely be back for a third stay in the near future! Anybody I've stayed here with would highly recommend this cabin! This cabin is wonderful. We've stayed in others in this area, but none as charming as this. We would have been content to stay there and enjoy the comforts of 'home', but the weather was too nice to miss out on hikes. The location is great, with a rock climbing area just down the road. This cabin is full of interesting architectural details, like the frosted glass on the doors, the wooden ceiling beams, the beautiful wood floors, and the windows all around. It really did feel like we were in a tree house! Hosts Julie and Mark keep the place neat and clean, with all the amenities you'd desire. There were hundreds of DVDs available, but the hot tub was what we liked best. We brought food and found everything we needed to prepare it amongst the kitchen equipment. The front deck was a great place to hang out and enjoy nature. I'd recommend this place to anyone who wants a getaway with charm and comfort! We have stayed at The Pine Tree House several times now and plan to continue to keep it as our favorite HH 'get-a-away' spot. The location is very convenient to all the 'hot spots' in the area, and just minutes from Logan. The cabin is cozy and warm. I felt at home, away from home. The owners are very kind and accommodating and not like 'drill sergeants' as with other cabins we have stayed where notes all over the cabin with do's and don'ts. If you have common sense and respect for other peoples property these are not required, and if you don't, then you need to stay at home! The atmosphere makes you feel at home and at ease. We felt comfortable, not like you are 'invading' their space. My goal with staying away from home is to relax and breath easy, and this is definitely possible to accomplish in this beautifully designed cabin! I highly recommend it to anyone wanting a refreshing break from it all! !